WOW! THERE WE WERE! THRILLING!!! 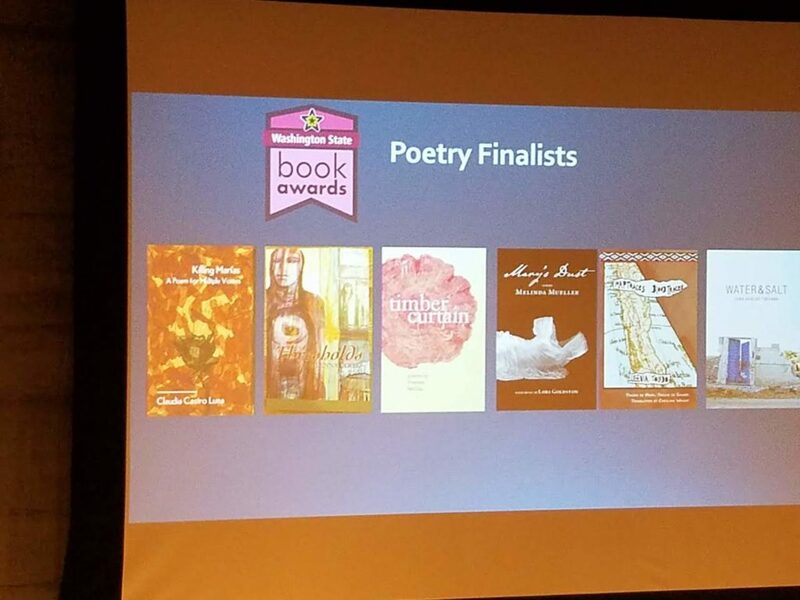 It was incredible to have our book, Mary’s Dust by Melinda Mueller with music by Lori Goldston selected as one of this year’s Poetry finalists. Now, we did not win. 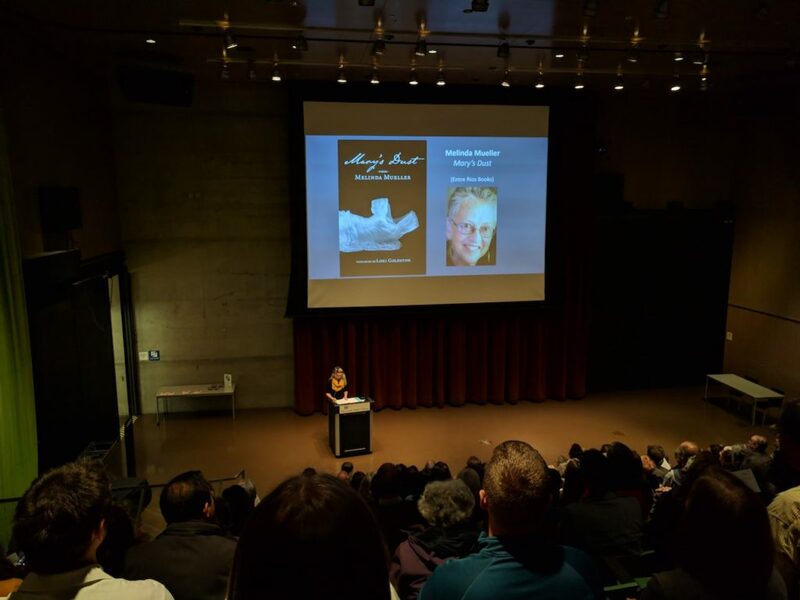 A heartfelt congratulations to Lena Khalaf Tuffaha and the awards did what it should do which is highlight a Washington State poet get you to add their book to your reading list. I am certainly adding, “Water & Salt” to mine! And a congratulations to all the winners and finalists! You can see the whole list and learn more about the Washington Center for the Book at the Seattle Public Library here. 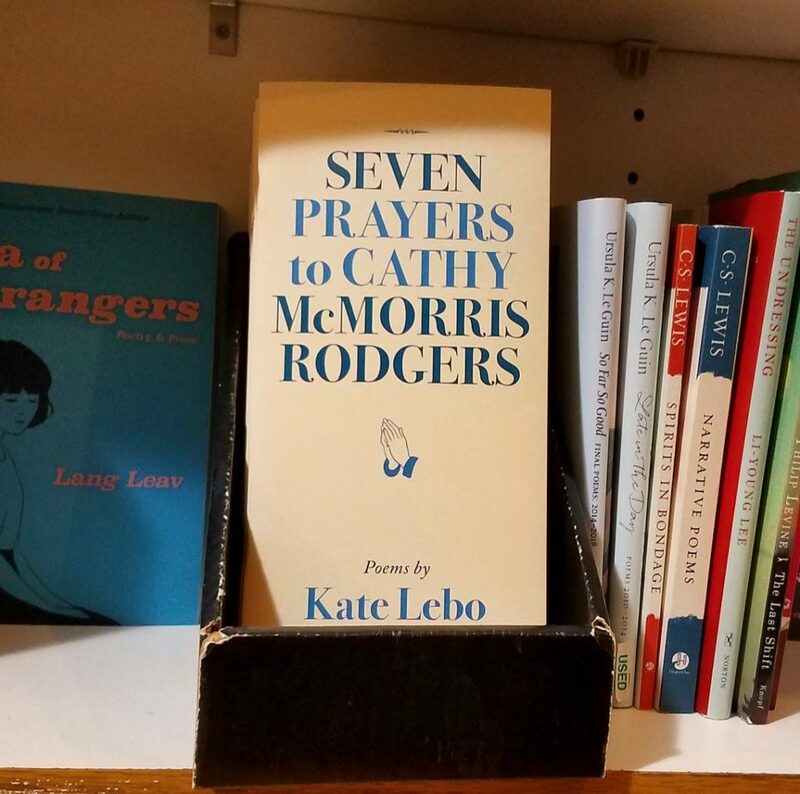 While we’ve been sending tons over to our friends working on Democratic campaigns through the Fifth District, if you happen to be in Spokane, you can buy a copy of Kate Lebo’s Seven Prayers to Cathy McMorris Rodgers at Auntie’s. This helps us offset all the free ones we’re sending out and we thank you for that. 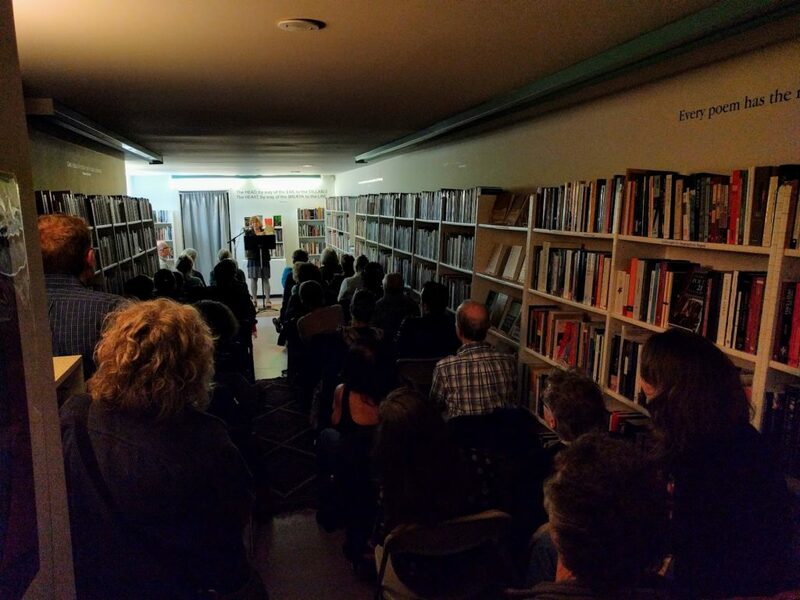 Thanks to Open Books for hosting the book launch for our new translation of Amelia Rosselli’s “Diario Ottuso/Obtuse Diary” by Deborah Woodard, Roberta Antognini and Dario De Pasquale. 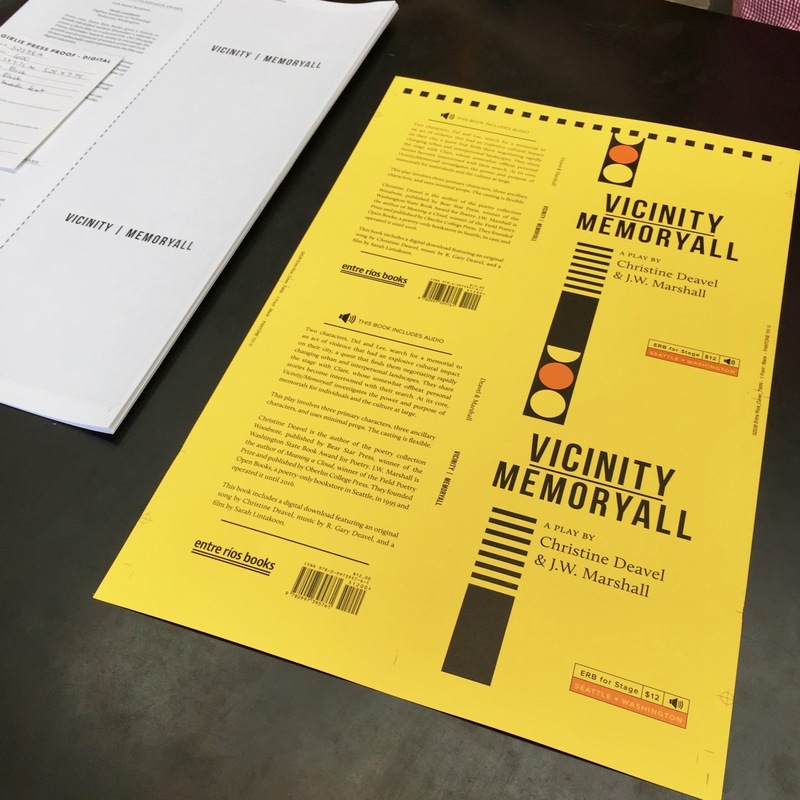 Here’s a short segment from the last section of the book, “Obtuse Diary” read by Deborah Woodard and actor, Riccardo Pieri. I thought this presentation of a bilingual text was really effective and an imaginative way for an (primarily) English-listening audience to comprehend the meaning, while still hearing the sound of the work. M. Seven Bremner ready for all your poetry needs at the Jackson Street Jazz Walk! We were thrilled to once again sponsor some live poetry at the Jackson Street Jazz Walk! 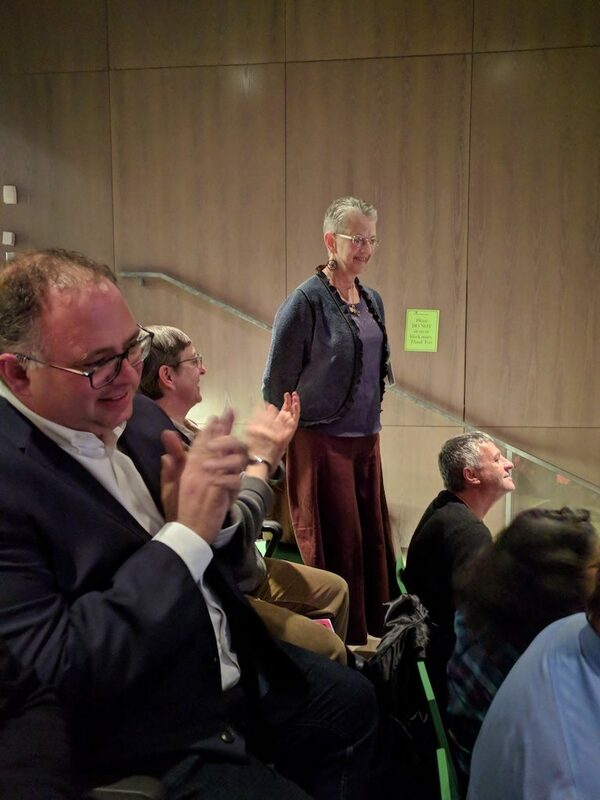 But mostly, after organizing this for the last four years, it was a delight for Year Five to just go as a participant and leave the difficult job of organizing to Eugenie Jones. Yes, it was different, but hello, that is what keeps things fresh! SO IT WAS AWESOME AS ALWAYS. 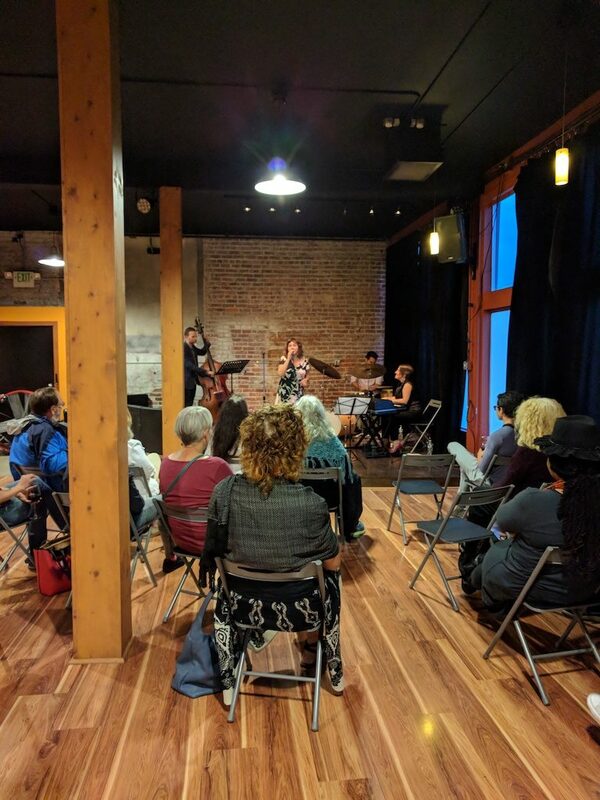 We have a lot of issues in the Central District that are direct result of systematic racism and economic inequality… but we also have a lot of GREAT neighbors and nothing like music and art to get everyone out together having fun. And my belief, from the minute I started this project, was if you can get people together having fun with each other, it makes having the difficult conversation and work in a neighborhood easier. Still hard, but easier. 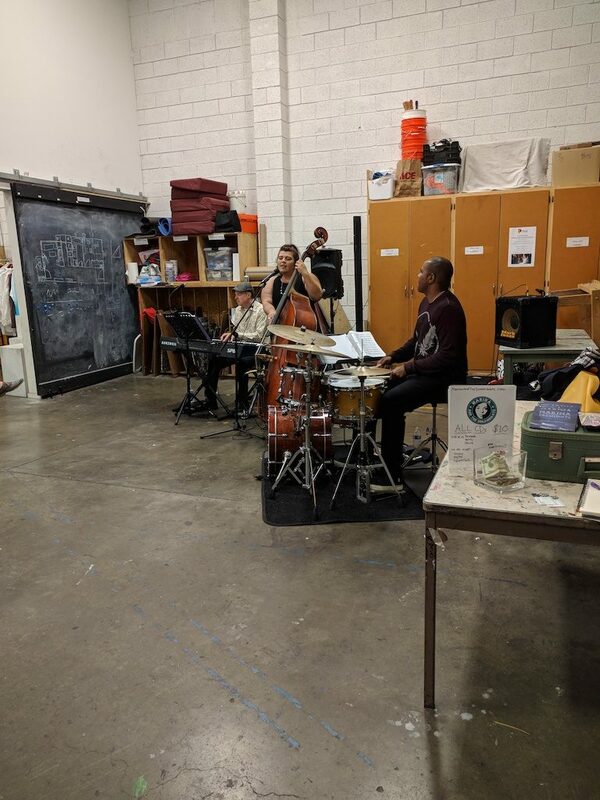 We are once again proud sponsors of the Jackson Street Jazz Walk, happening along Jackson Street and within walking distance of Enter Ríos HQ on Saturday night! 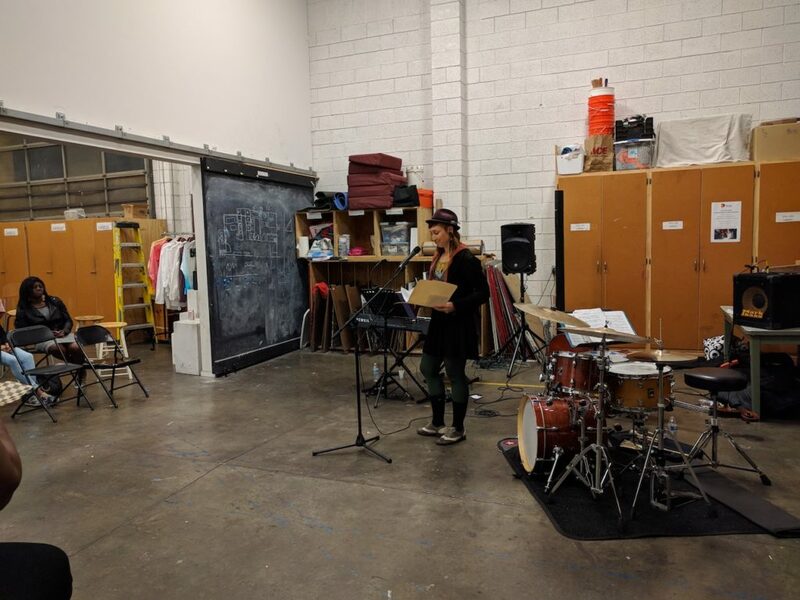 For four years, I was the organizer of this event and one of the things I am proud of is always finding a way to include poets: spoken word mic, Fresh Roots, Paul Nelson read last year, William Curtis… This year, we are happy to bring M. Seven Bremner to the parking lot at Pratt for some impromptu poetry. Marlene Seven Bremner (Seven) was born in Frankfurt, Germany in 1983, and currently resides in Olympia, WA. 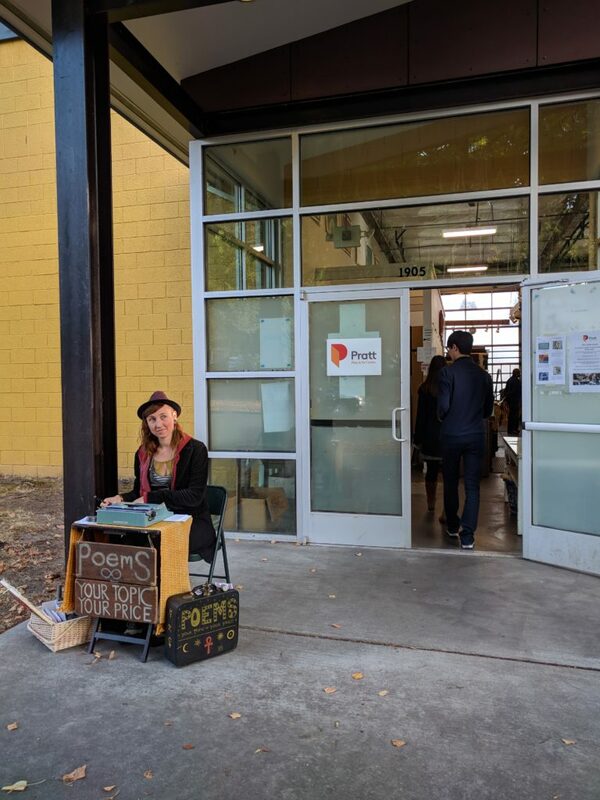 She was first introduced to the Poem Store in 2015 and fell in love with the spontaneity of it and the opportunity to connect with her community through poetry. 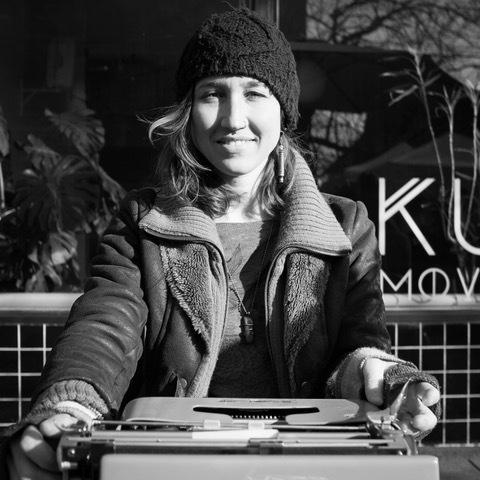 You can find her with her vintage Olivetti Lettera 22 typewriter at the Olympia Farmer’s Market and the Ballard Farmer’s Market in Seattle, typing custom poems based on any topics you provide. When she’s not at the markets you can find Seven writing and painting in her downtown Olympia studio. Why are they are in the parking lot at Pratt now? 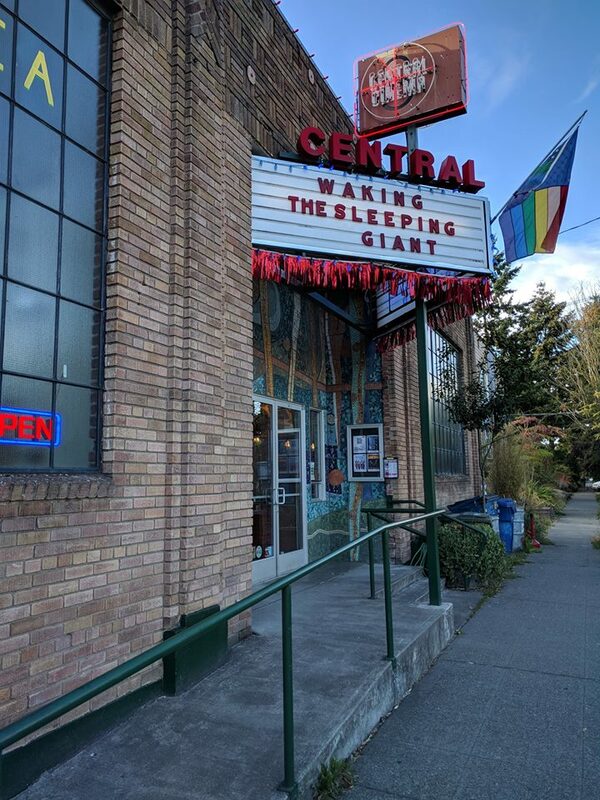 Because our venue where we had some awesome spoken word mics complianed the poets didn’t drink as much as the jazz listners/musicians… so you know, poets, some folks have drinking goals for you! Ha! 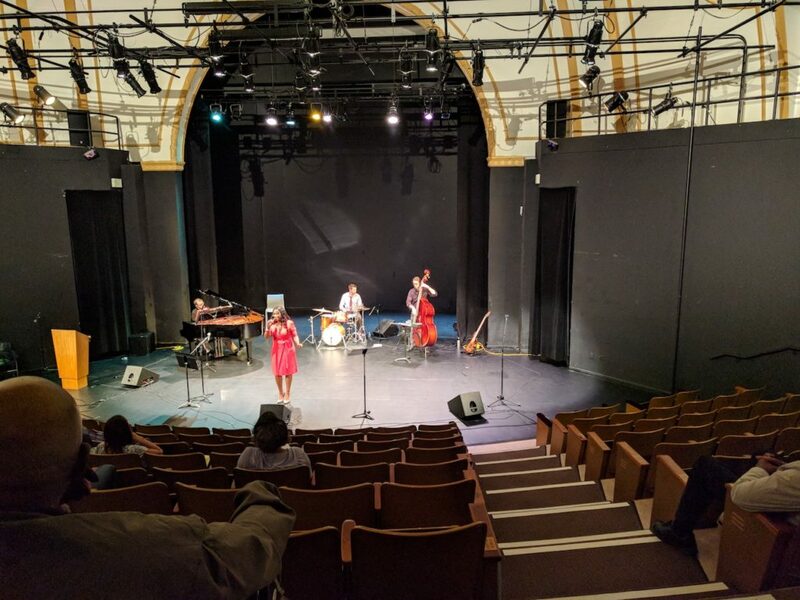 So learn more about Seven on these links and come get a poem while listening to great music and checking out the art scene at Pratt Fine Arts Center. 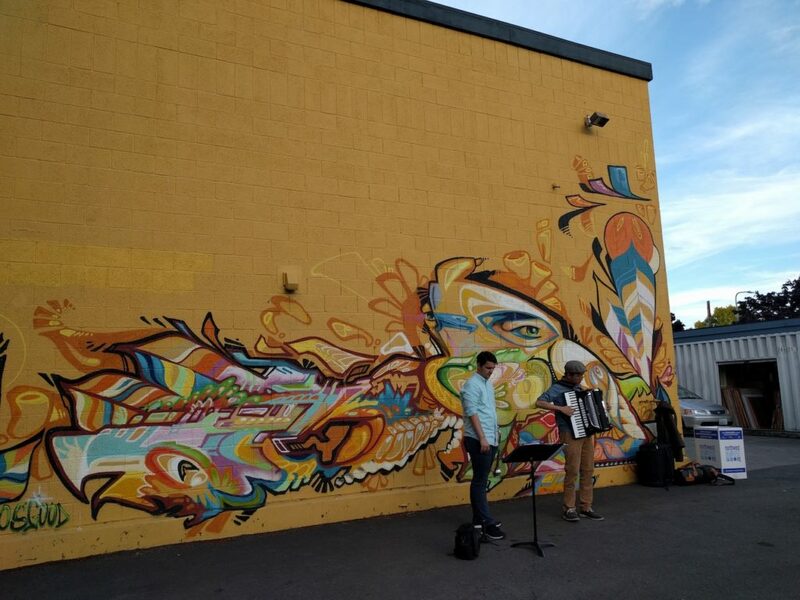 Poetry Website: www.yourtopicyourprice.com Instagram: @m7artist Facebook: https://www.facebook.com/marlenesevenbremner.art/ AND HERE IS THE LINK TO THE JACKSON STREET JAZZ WALK FACEBOOK PAGE!!! 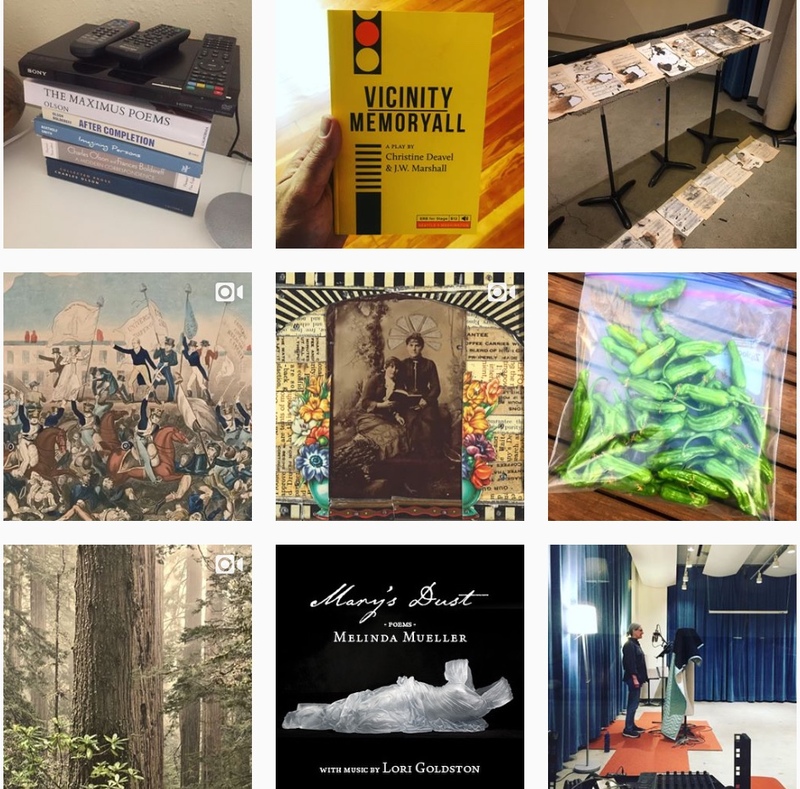 Find us and follow us at Instagram at @entreriosbooks. Press Check! 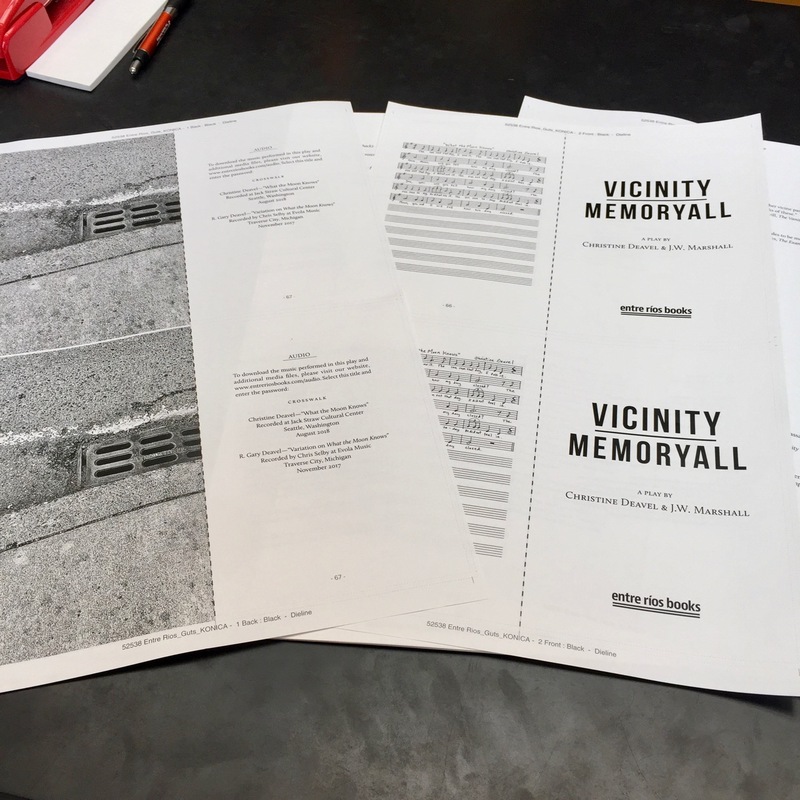 Our first play, Vicinity/Memoryall! I knew that we’d likely be able to bring back from the Midwest industrial printers this book for local printing. It’s a simple “saddle stich”, that is stapled booklet, meant to reference (and celebrate) the Dramatist Guild playbooks. 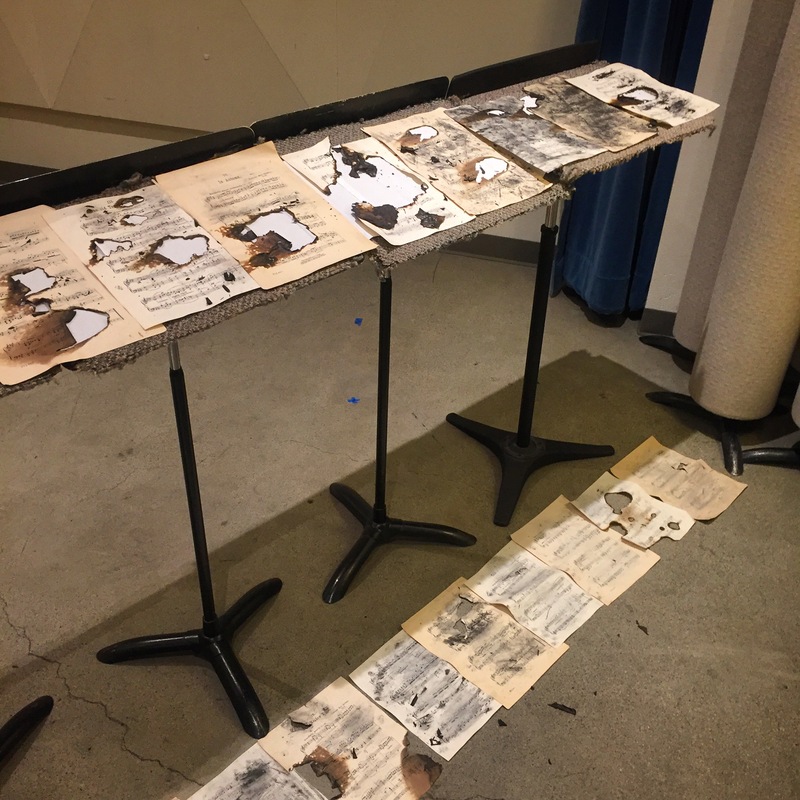 I’ve got great memories of these functional playbooks from drama club in high school and so it was with great happiness that the writers, Christine Deavel and J.W. Marshall, also were intrigued to put the play in this format. It’s the same size, the same tight gutters, and really designed to be used by actors, with page breaks made thinking through how actors might memorize their lines. I’ll be curious to chat with them on it as this play moves into production. 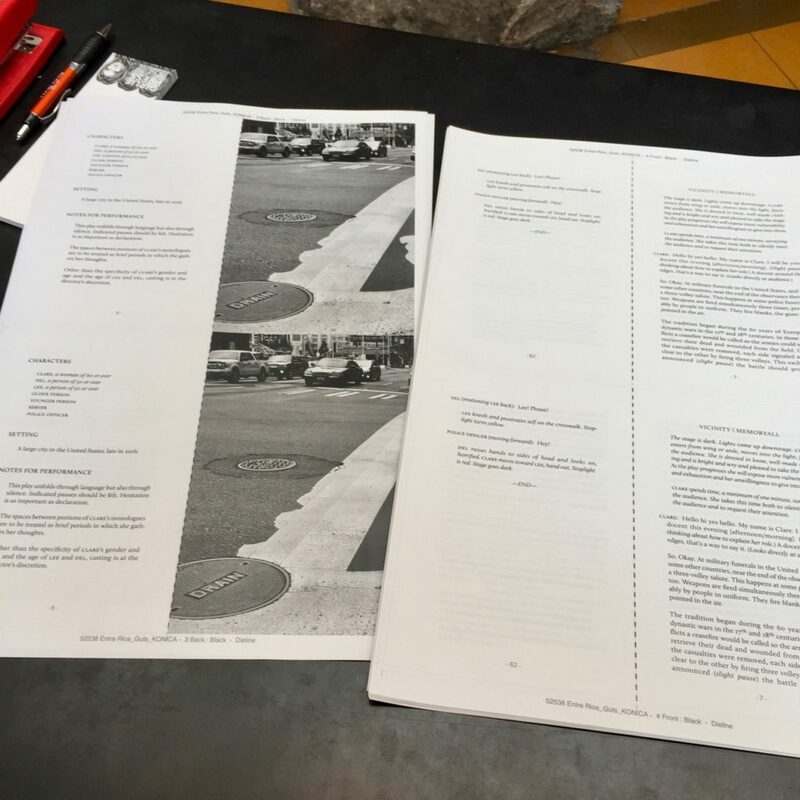 Printing in this format also helps keep our cost down so I am hopeful we can print another play soon by Northwest playwrights or poets turning toward play writing. I am very happy to be printing with Girlie Press, a woman-owned small business that I can walk to. How wonderful to not have to pay shipping as well as reducing the carbon from that. I’ve only done a few press checks and feel quite silly at them, though it’s exciting to see if how you imagine it printing is going to be the way it actually works in the real world. I’ll be mostly curious to put this book next to the Dramatist Guild books and see how it feels. Will it feel ready to use for work?